If you haven’t noticed, the world we live in is quite unstable. Everywhere you turn there is some new tragedy. There are global tragedies like ISIS and the Ebola virus. And Ebola has now turned into a national crisis. Ferguson, Missouri continues to be in upheaval and new, tragic stories continue to pour in about tensions between white police officers and black citizens. In my city, the last few weeks have seen a great deal of stir from a beheading in a workplace and a vicious news reports about a man suspiciously walking through a public school. As I talk with people and scroll through social media, I see one dominating narrative about the world we live in: Fear. And it seems to me that there is a higher sense of fear than I have experienced in a long time, if ever, as a person in my thirties. And as fear spreads, it seem the discussions of “them” and “us” are more prevalent and carry a lot more emotion. Because of all of the craziness in the world, people quickly divide up who is deserving of what. I am quite tired of the conversations where people so non-nonchalantly place certain human lives as more valuable than others. Over and over I hear sentiments to the tune of “get rid of those people,” “keep them away from me.” And while it is not always explicitly communicated, these statements carry with them strong sentiments of who is worthy of life and health. The media seems to heighten the fear as well. I read a pretty reasonable article from a doctor about Ebola this week that was wrapped in Twitter headlines that wanted you to believe Ebola was lurking at your front door waiting to pounce. Again in my city, something as strange as a man wandering into a school turns into a frantic conversation about the religion and race of the person who wanders in. Assumptions were made about this man’s ethnicity and religion and the assumptions flew unfounded (and eventually proven false) everywhere. Other local businesses have even begun to say they will no longer serve Muslims. Fear driven profiling and stereotyping quickly turn into violence, discrimination, wrongful accusation, and inhumane treatment of other human beings. Aren’t we a more evolved society than this? Isn’t racism and cultural bigotry a thing of the past? The headlines of today’s news show the realities of these evils, and how “us” vs. “them” is now being used in a growing pandemic of fear. Now, in no way do I want to down play the seriousness or even scary-ness of the topics I have mentioned above. They require serious attention and reasonable action. I don’t want to walk trough my everyday life worried about a terrorist attack or catching a virus. I can’t wrap my mind around the awfulness of a beheading taking place a few miles away from me. I don’t want creepy people wandering around my kid’s school in any way form or fashion. Christians are not supposed to be people of fear. 1 John tells us perfect love (which is the definition of God and revealed by Christ on the cross) drives out fear. 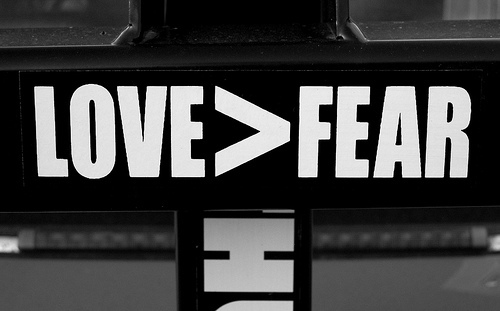 Fear is the opposite of love, the defining characteristic of God and God’s people. But when I look at the headlines, I see a lot of fear. And I see that fear causing a tremendous amount of problems. As if the evil and awfulness around us aren’t enough, fear and hate now occupy the minds of even those removed from the tragedies. I have few answers to these problems, but what I do know is we need to find a way to have better conversations and take better actions that engage us rather than separate. We need to be responding with love rather than fear. But since I don’t have a whole lot of answers, I want to suggest three questions which I do think might offer a better way forward. 1. How am I letting fear determine my responses? Biologically, fear shuts down our ability to think critically. Not only that, but when we allow fear to control our response to something, we train our minds to respond this way in the future. Pretty soon, every time you hear or read words like Ebola, ISIS, etc. you unconsciously respond with fear. Which means you aren’t thinking through the issue clearly. The cure to this is paying attention to what makes us afraid. The mind is an expert at pushing back fear when we want it to. So instead of training ourselves to respond to fear, we need to pay attention to the things we are afraid of and begin to ask better questions. 2. What does it mean to love in this situation? What does it mean to love those infected with Ebola? What does it mean to love their families? What does it mean to love our neighbor in ways that keep them from contracting a disease? What does it mean love the victims of horrific tragedy and violence? What does it mean to love people who fear for their lives simply because they interact with people of other colors? What does it mean to love the people who are being treated differently because of their skin color or religion? And perhaps the most difficult question: What does it mean to love our enemies? These are hard questions to ask in chaotic moments. But love is the defining characteristic of Christians. So if we aren’t asking these questions, are we really thinking and behaving Christianly? 3. What is my responsibility in the situation? Once we have thought through what it means to love, we then have a response and an action we need to make. Perhaps it means we move toward something rather than draw away from it. Perhaps it means we change the way we speak about certain situations and people. Perhaps it means we take a small step to stop letting fear determine our response. No matter what it looks like, love requires us to respond. And the fear and chaos and violence in the world are begging for thoughtful, cross-like, loving responses from people who are no longer willing to be driven by fear. I have many more questions than answers. But I know we need to change the conversation. We need to stop fearing the darkness and start bringing the light. May we have the courage to stop letting fear control us and enter into new conversations which allow us to spread the good news of Jesus to the dark world around us. This entry was posted in Ordinary Days and tagged Ebola, Fear, ISIS, Love, Moore beheading, Response. Bookmark the permalink.